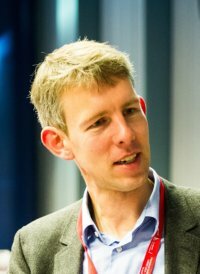 Maarten van Aalst has been appointed full professor for ‘Spatial resilience for Disasters Risk Reduction’. This research chair was presented last year by the Red Cross and the University of Twente in the name of Princess Margriet on the occasion of her 75th birthday. The Prinses Margriet Research Chair is established within the Faculty of Geo-information Science and Earth Observation (ITC) at the University of Twente. Maarten van Aalst will combine this professorship with his current role as director of the Red Cross Red Crescent Climate Centre, a global team of 35 experts who support the international Red Cross Red Crescent Movement in dealing with the rising risk of disasters in a changing global climate. Van Aalst is also Coordinating Lead Author of the Intergovernmental Panel on Climate Change. He obtained his a PhD in atmospheric science from Utrecht University in collaboration with the Max Planck Institute for Chemistry in Mainz, Germany. In recent years he has also been associated with the International Research Institute for Climate and Society at Columbia University, New York. The purpose of the chair is to strengthen scientific knowledge of natural disasters and climate change for disaster prevention, and enhance the impact of humanitarian aid. Its research will be directly applicable to the work of the Red Cross Red Crescent, which is devoting increasing efforts to anticipatory action ahead of disasters, as this is often more effective than providing emergency aid in their aftermath. The chair is established within the faculty of Geo-information Science and Earth Observation (ITC) at the University of Twente, because of its focus on capacity development and long cooperation with the Princess Margriet Fund for disaster prevention. The ITC has already five research chairs in the domain of natural disasters, risk management, post-disaster reconstruction and risk reduction. The chair on Spatial Resilience and the cooperation with the Red Cross Red Crescent Climate Centre will further increase ITC’s societal impact.